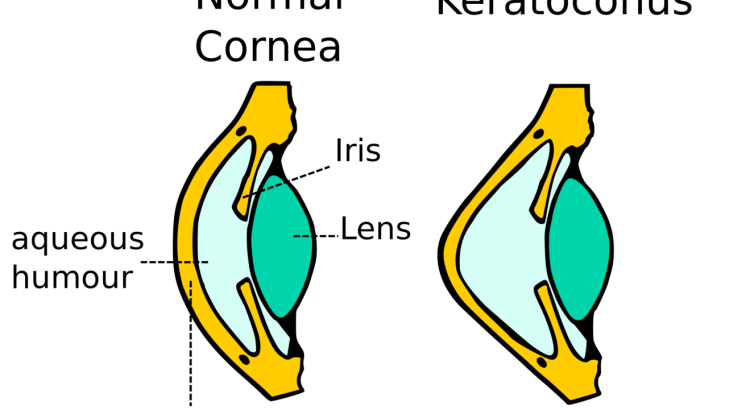 So what is Keratoconus? The long and short of it is football shaped eyeballs. Strange? Yeah. The underlying cause is still unknown but the shape results from the stretching and thinning of the cornea. Over time the front of the eye loses its spherical shape forming instead a bulge or cone. This greatly affects the eyes ability to focus, and as it is progressive so is the damage to a persons vision. Timely vision, refraction, and corneal scan tests can help to track just how much change has occurred over time, and inform what steps to take next. So what do you do when your cornea is deteriorating? You talk to your Ophthalmologist and weigh your options to decide what’s best for you. From glasses to contact lenses to corneal cross-linking (CXL) the options sure have improved since I was first diagnosed. Glasses are always the first option. They are easy to wear easily maintained and can be very affordable. So on the off chance you loose one, a cheap replacement is easy to find. There are wide ranges of colors, styles, and customisation options to suit individual tastes and sense of fashion. As your vision changes new prescriptions can be quickly issued to help maintain your sight. Rigid Contact lenses are very discreet and can be more effective than glasses. They too have come a long way with new advances in gas permeable or sclera lenses, contacts may be the way to go. However, they can still be very uncomfortable and costly and come with some risks and hassles like remembering to put them in/take them out, cleaning, moisturising, sanitizing and infection prevention. And of course popping out with any wayward sneezes. But a clear face and an unobstructed view of the world is well worth it. The next option is to stop the progression of the degeneration. Corneal collagen cross linking does this by strengthening chemical bonds in the cornea using UV light and photo-sensitizers. Better yet the procedure itself only takes 30 minutes. You’ll still have to wear glasses or contact lenses but your vision will no longer continue to degenerate. This is the newest least invasive option and may not be available everywhere so be sure to research. For more serious damage, cornea transplant surgery may be needed. There are many different transplant methods available on NHS. Support groups can offer information and insight to help make an informed decision.